With sites as MySpace and Last.fm it's extremely easy to get your music to people all over the world. There's just one small catch: you gotta have recorded music available. Promoting your music online isn't the only reason to record a demo: a lot of venues want to hear your music before they'll let you play. You can go to a professional studio to record your music, but that can be expensive. Luckily these days there is a lot of very good equipment available for afforable prices. For about $300 you can have a pretty decent set-up to records you own demos. 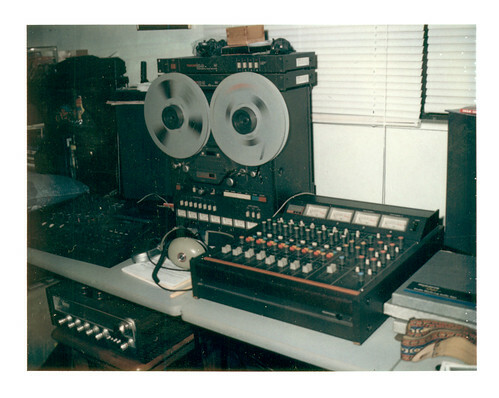 This article shows two possible basic recording set-ups for recording at home or in the rehearsel studio. To get quality recordings with these set-ups you'll have to record each instrument at a time instead of everything together. Of course if you have more cash available, the sample set-ups are easily upgraded with more mics or better equipment. You need at least one microphone to record. I won't go to deep into the details, but there's to main types of microphones: dynamic mics and condensator mics. A lot of people will say condensator mics give a better sound, but decent condensator mics are more expensive than dynamic mics, are less durable. If you want a mic you can also use live without worrying about breaking it, which also gives a good sound for the price, I'd advice a Shure SM58 or SM57. There's a reason these mics are the most used worldwide. The SM58 is somewhat better for vocals, while the SM57 is better to record instruments. You need an interface to connect your microphone to your computer or laptop. It will translate the signals of the mic to signals you sound card understands. There are numerous options available when picking an interface. Interfaces use different ways to connect to your computer. Both FireWire and USB interfaces are available. Make sure you buy one with a connection your computer has available. Good brands include Tascam and M-Audio. To start out an interface with two inputs is more than enough. With those you can record two tracks at the same time, so you can record either two instruments or one instrument with two mics (which is very handy for recording drums). For a slightly lower price you could also settle for an interface with one input. To record and mix music on your computer you also need software. Luckily most of the interfaces come with software. The interfaces of Tascam for example come with Cubase LE, a basic version of Cubase. If you have a preference for the software you want to use, make sure to check if the interface you'll buy supports it. For somewhere between $80 and $150 dollar you should be able to buy a pretty decent audio interface. A slightly more expensive setup, but easier if you want to record away from your home, for exampe in the rehearsel studio, uses a portable recorder, which records to flash card or hard disk. Watch out which one you buy! Some recorders have flash cards while others have hard disks. While the latter are more expensive, they do have more storage for your music. If you only record short songs, or move your songs to a computer reguraly you can save money, but make sure you pick the right recorder for your use! I know, I'd rather buy a HD recorder. Most of these recorders can record two track simultaneously, and keep track of 8 tracks, which is enough for most demo recordings. It's also possible to go for cheaper a 4-track, but for most companies 8-track recorders are the current minimum. It's possible to mix your song on your recorder, but software currently available has far more options usually. Most of the current recorders come with USB interfaces so you can transfer your recorded tracks to your computer and open them in your mixing/recording software to process it further. Audacity is free open source recording and editing software, for demo purposes it's very good. To keep it low budget I included just one microphone in each set-up. Most of the interfaces and recorders I mentioned have the possibility to record at least two tracks simultaneously, so getting 2 mics is a good idea. If you have more cash available a good set of monitor boxes is a very good addition to your equipment. Normal hi-fi or computers boxes are not 'honest': they adjust frequencies to sound better. Which is good for people listening to your music, but when you mix your music your sound should be as natural as possible. For about $200-$300 dollar you can have a decent set of monitors like the Alesis Monitor One MKII . Is the equipment listed still to expensive? Try eBay or second hand stores. You can find slightly older models of current equipment for pretty good prices. Search for "4-track recorder" or "8-track recorder" on eBay and your bound to find something you can work with! There's a great number of good resources for home recording online. If you want to start recording seriously, check out sites like HomeRecording.com. Depending on your wishes both these set-ups should suffice for starting band wishing to record their own stuff. Both set-ups are easily upgradable and expendable. One warning.. By starting to buy your own recording equipment, you could trigger a gadget addiction! I have enough equipment to record good demos, but my wishlist of recording stuff only gets bigger! If you have any questions or remarks, don't hesitate to comment. I'd especially be very interested in experiences of people who already recorded their own music: what equipment did you use, and which set-up works best for you?